You'd be hard-pressed to find a better tablet at this price. Over the past few years, we've seen the iPad go from curious experiment to Apple's vision for the future of computing. But we've also seen the tablet market dry up — not even the iPad has been immune to those changes. Still, it's hard not to look at the new, 2017 iPad as a market mover, a $329 machine meant to appeal to newcomers and old-school iPad owners in need of an upgrade. While this iPad is priced for everyone, it's not meant for everyone. It's not as slim as older models, and it lacks some of the really neat features that appear in Apple's Pro line. In other words, the 2017 iPad is a no-nonsense machine. But, it's a damned good one. Be the first to review the iPad (2017)? No, it's not just in your head — this iPad feels very, very familiar. It's as if a designer tore a hole in time itself, reached into the past to grab an original iPad Air and stuck some more up-to-date parts inside. That said, Apple wanted to keep these basic models distinct from more premium iPads, so you won't find any Smart Connector pins on the iPad's left side or a laminated display (more on that later). 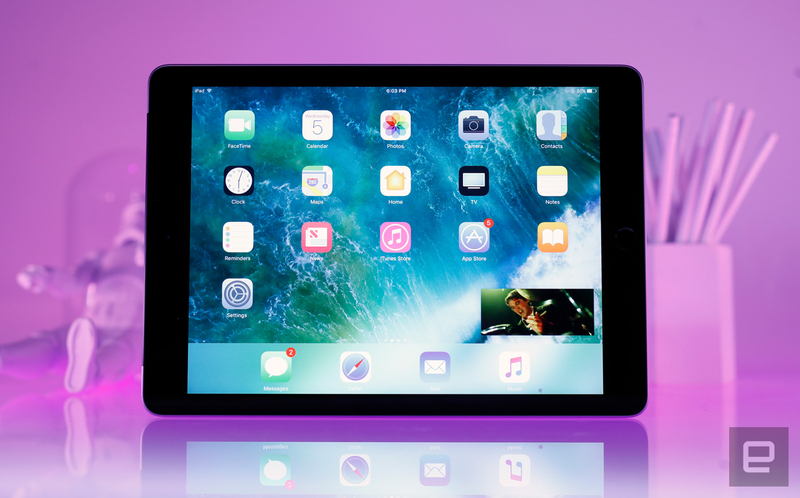 This presents a fascinating problem for Apple and its loyalists: This iPad effectively replaced 2014's premium iPad Air 2 as the best full-size, non-Pro tablet in the company's lineup. That wouldn't be a problem for some people if the 2017 iPad was as slim and sleek as the Air 2 was, but it's not. Both pack a 9.7-inch screen running at 2,048x1,536, but the 2017 iPad's 7.5m waistline is slightly thicker than the Air 2's, and it's a little heavier, to boot. These extra millimeters and grams may be a point of contention for some in the Apple community, and to them I say, "Whatever." Those minor changes barely registered after the first moments. (And this is coming from a guy who toted around an Air 2 until it died.) This thicker design was palatable once before, and while it's not as technically impressive as Apple's more recent iPads, I didn't notice my hands, arms or wrists getting more fatigued than usual while reading Kindle books for a few hours. And there's a plus side hidden inside this aluminum frame: Apple went with a 32.9Whr battery, which is much bigger than the Air 2's and even a little more capacious than the original Air's. Now, I miss the Air 2's design as much as anyone else, but it's nice to see a company — especially Apple — offer up better battery life, even if it comes at the expense of sleekness. Also inside the new iPad is one of Apple's A9 chipsets, which we first met in the iPhone 6s. It's paired with 2GB of RAM and either 32 or 128GB of storage. And no, that's not a typo: There's no 64GB option available. As always, you'll be able to shell out extra ($130, in this case) for an LTE-enabled model, which adds a few grams to the iPad's weight. 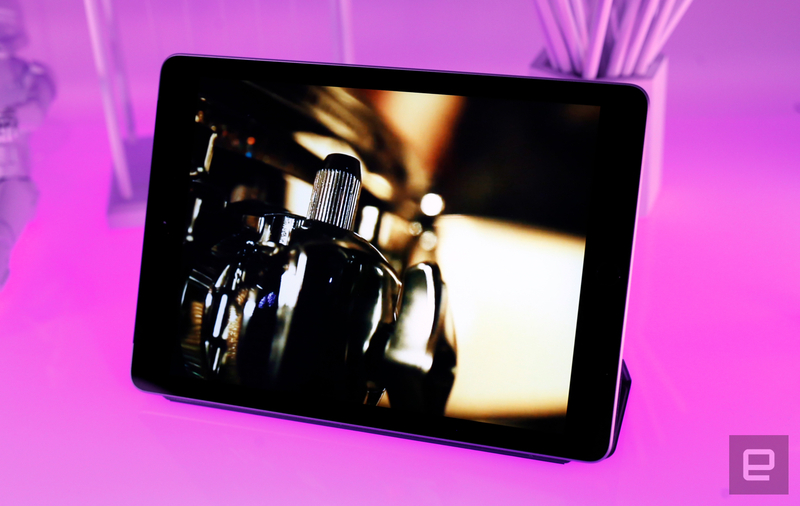 The new iPad is also home to an 8-megapixel rear camera that takes surprisingly good photos, and there's something to using such a big screen as a viewfinder. But you'll still look a little silly doing it, and your phone is probably the better camera anyway. And then there are the little things. The Touch ID sensor embedded in the home button works as fast as the iPhone 6s' -- which is to say you'll probably never have trouble with it. Oh, and Apple moved some magnets around, so most original iPad Air cases won't work correctly with the 2017 model. The 2017 iPad's screen runs at the same resolution as the Air 2 and the 9.7-inch iPad Pro, but there are a few key differences. See, all of the new iPads Apple released in the past three years had optically-laminated displays; that is, the screen was physically bonded to the glass, leaving no gap between them. Not so with this iPad. This saves Apple some money in the manufacturing process but it keeps the iPad from feeling like a seamless window onto the digital world. That said, if you hate the hollow thunking sound that comes with tapping a nonbonded screen, maybe just stay away from this one. You also won't find an anti-glare coating on this iPad's screen, either, likely another cost-saving measure that I wish Apple had reconsidered. The display itself is actually slightly brighter than the Air 2's (500 nits, compared to the earlier models' 400), which keep visuals nice and legible in most situations. Things get a little hairier when you take the iPad outside or into a bright room; reflections that seem dull on the iPad Pros are more distracting on this model. 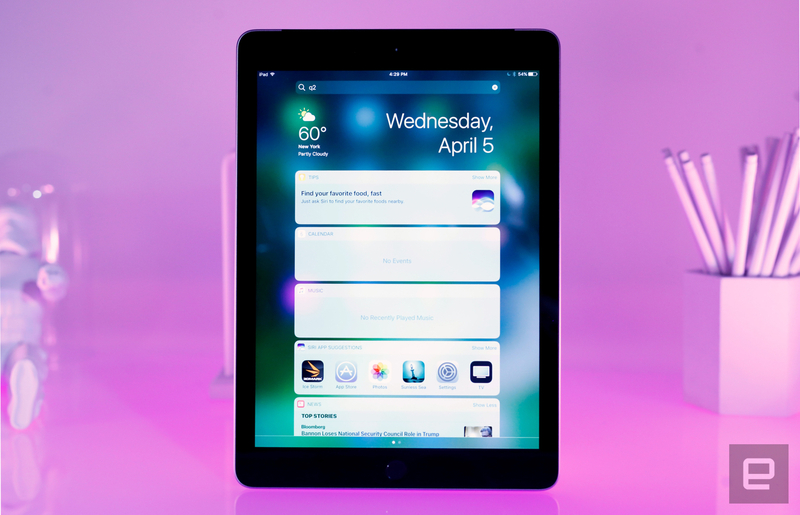 For an iPad that's mostly great, this stands out as one of its most pronounced bummers. Those compromises, while not ideal, aren't deal-breakers considering the price. That gap doesn't matter much when you're looking at the iPad dead-on, where colors are bright and vivid. Viewing angles are still quite good, so (assuming you dodge those reflections) you won't have trouble sharing videos with the people sitting next to you. The sound, meanwhile, hasn't changed much since the days of the Air 2. There's a single row of speaker holes drilled into the iPad's bottom, and the output gets plenty loud without distortion. You'll miss out on some bass relying on these built-in speakers, obviously. But, thankfully, Apple isn't taking a stand here -- there's still a headphone jack, so you can plug in your go-to cans. While we've tested some faster iPads, make no mistake: Cheap or not, the 2017 model is a big step up from most earlier models. That's all thanks to the included dual-core A9 chipset (clocked at 1.85GHz, or so Geekbench says) and 2GB of RAM, which allows for comfortable web browsing, app use and multitasking. Over my week of testing, I mostly used the iPad as a productivity and gaming machine, so I'd punctuate long stretches of email triaging and Slack messaging with a few rounds of that Elder Scrolls card game or cruising around in Galaxy on Fire 3. The iPad handled all of these tasks with only the occasional hiccup when I was trying to flummox it by rapidly jumping in and out of apps. It just works well, and that's a pretty big compliment. I never found myself wondering why something was taking so long to load. 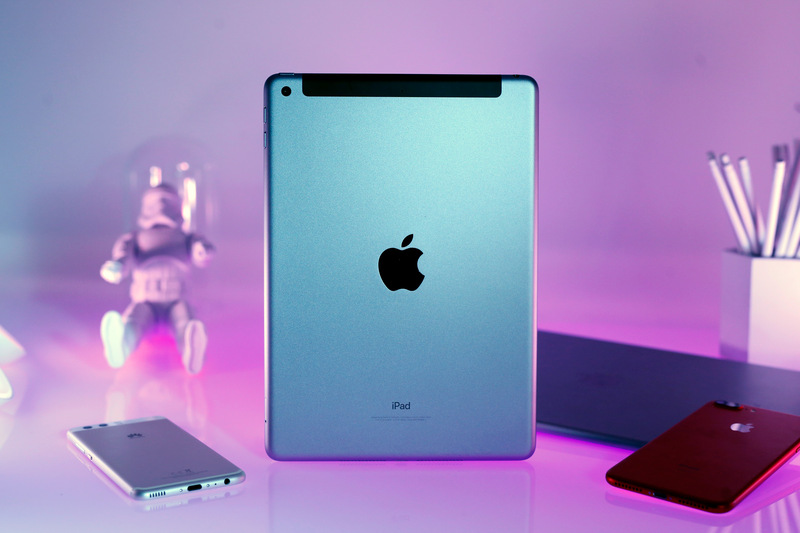 Our usual slew of benchmarks bear out my experience: While less powerful than either of the two iPad Pro models, the 2017 iPad showed healthy gains compared with the iPad Air 2. There's really not much to say on the software front -- the iPad comes loaded with iOS 10.3, which should be plenty familiar by now. You can check out the broad strokes in our iOS 10 review, but you'll now benefit from Apple's new, more-stable file system and the ability to locate errant AirPods. 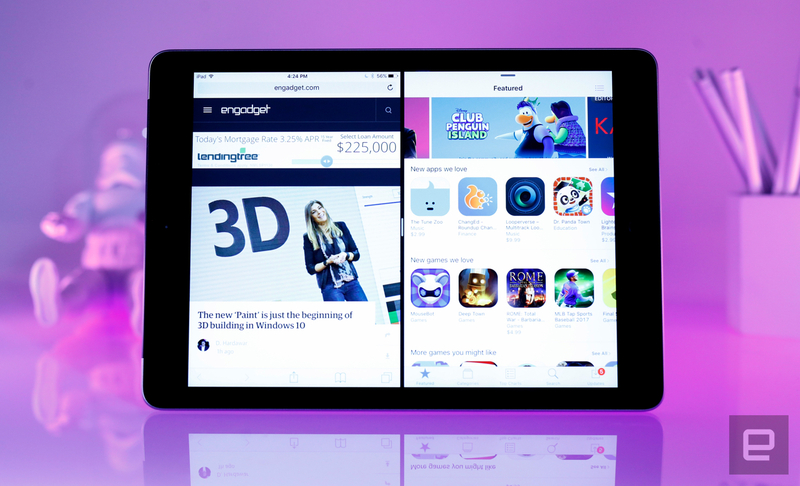 If nothing else, the iPad is a capable foundation for features like split-screen multitasking. Running two apps in side-by-side windows worked well enough on my old Air 2, but the extra power produced by the new iPad's A9 kept everything running more smoothly. It's clear why Apple wanted this iPad to exist. 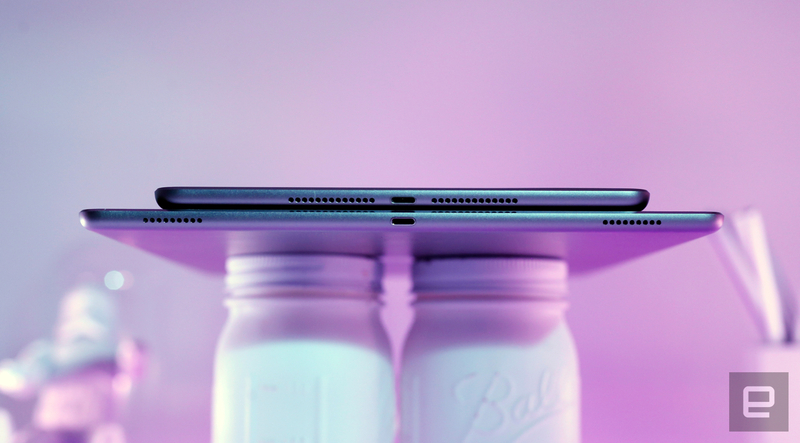 It isn't just because the company needed a low-cost tablet to boost its bottom line; it also wanted to provide a stronger base level of performance to help iOS really shine. More important than the software that comes on the iPad are the updates it will eventually get. 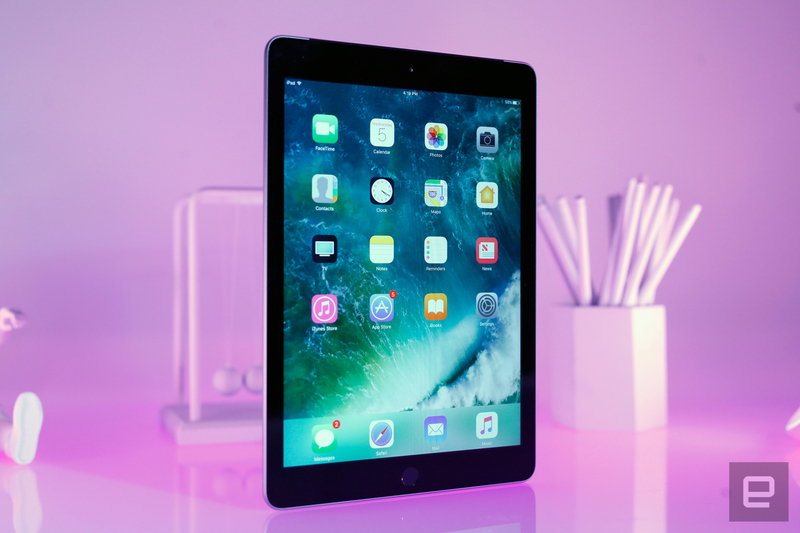 With the introduction of the 2017 model, people can go out and buy a relatively cheap iPad that'll continue to be supported for years. That's a pretty big deal when you consider the Air 2 — the previous budget-friendly 9.7-inch iPad — is more than 2 years old. Future versions of iOS and the apps they enable will continue to tax our hardware, and a longer support window is reason enough to buy this model over an aging Air. I was concerned that Apple's choice of chipset might have had some effect on battery life, but I shouldn't have been. 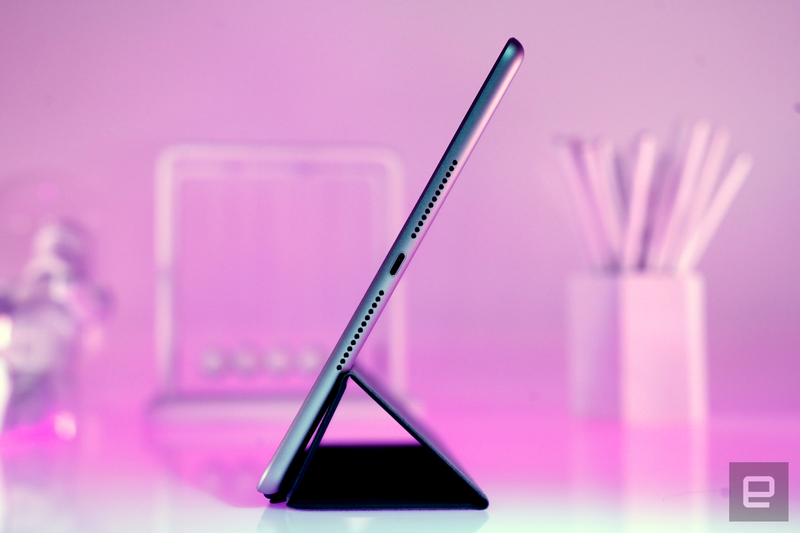 In terms of pure longevity, this is one of the best iPads we've tested. Consider the standard Engadget video rundown test, where we loop an HD video with the screen set at 50 percent brightness: The 2017 iPad lasted for 12 hours and 41 minutes. That's well ahead of either the iPad Pro and the Air 2. (The only model that came out ahead was the iPad mini 4, which obviously had to drive a much smaller screen.) That's also well past the 10-hour figure Apple trotted out once again, which isn't exactly a surprise. Apple, after all, is notorious for low-balling its battery estimates. It holds up well when you're doing more than bingeing on The Night Manager, too. When it came to my usual working-and-gaming cycle, the iPad stuck around for five or six days of consistent use before needing a recharge. With a price starting at $329, there aren't many good, direct competitors to the 2017 iPad. Devices like the new Galaxy Tab S3 are more expensive and are meant to stack up against the iPad Pro. Samsung's Galaxy Tab S2 could be a worthy alternative if you haven't pledged allegiance to an operating system. It packs an incredible Super AMOLED display and a surprisingly clean, if not quite up-to-date, build of TouchWiz'd Android 6.0. If you plan to pick up a low-cost tablet for gaming, you might also want to check out NVIDIA's Shield K1, which starts at $199. It packs a smaller 8-inch screen, but the included Tegra chipset and mostly clean build of Android 7.0 Nougat make it one of the better inexpensive tablet picks. That said, the 2017 iPad would still be our pick -- it's the most tantalizing choice for the money. This iPad, perhaps more than any in recent memory, is an exercise in compromise. Yes, Apple has said that the iPad most clearly represents its vision of "people should get things done," and the development of products like the iPad Pro speak to that belief. There is a time for innovation, and this wasn't it. This time, Apple was just trying to build the best iPad it could for the masses. In that respect, it did a great job, even if the result isn't as exciting as everyone hoped. I feel for people who wanted something a little sleeker or more powerful: They have no other choice than to pay up for the Pro line. For everyone else, though — people who have never had iPads or people stuck with really old ones — this thing is a tempting buy that won't let you down.